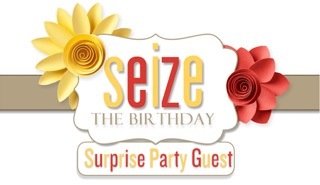 Today I have the honor to be a Surprise Guest Designer at Seize the Birthday! I am super excited to join this talented group of designers for the months of October and November! Thanks again Nancy for having me, I am thrilled! 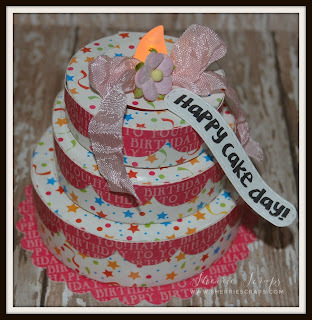 I found this darling 3D cake at the Silhouette Store and couldn't wait to create it~My Granddaughter, Arya will be turning 5 real soon and I thought this would be a fun decoration at her party. 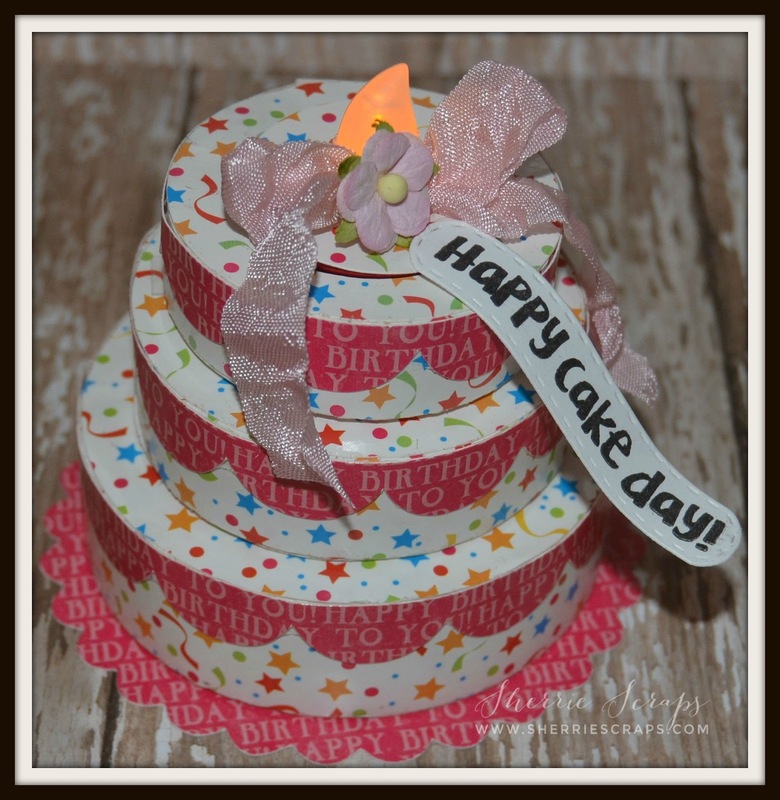 I used papers from DCWV "The Birthday Wishes" stack. So many FUN papers in this stack. After cutting all the pieces on my Cameo, I then assembled it. I added a flickering battery tea light, a pretty pink bow with ribbon from Karen at Little Scrap Pieces. 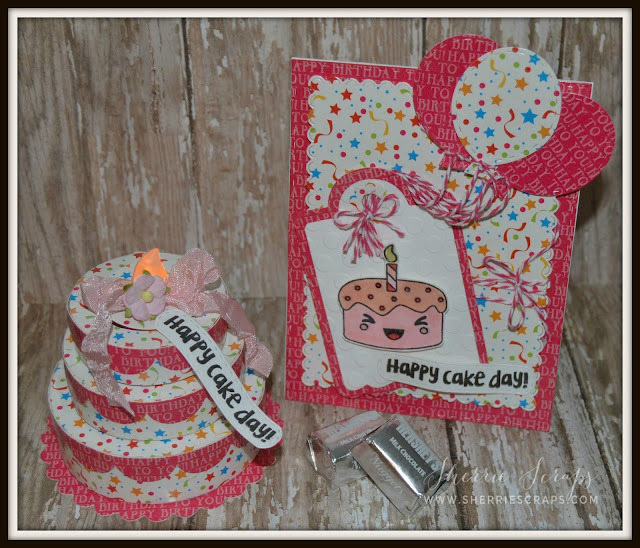 I finished with a banner created with Jaded Blossom Mini Tag Dies 2 and the sentiment is stamped with the Cake Day stamp set. 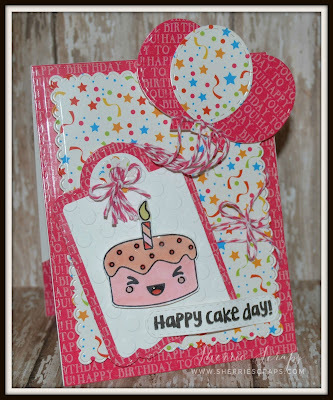 The matching card is created with JB Rectangle Dies 1 for the base and the base layer with the Scallop Rectangle Dies 2. I then layered a tag created with JB Luggage Tag Dies. I embossed it with the Spots and Dots folder. The yummy cake is stamped with the JB Cake Day stamp set and colored with copics, wink of stella and a layer of Glossy Accents, The balloons are tied on with twine from my stash and the balloons are from JB Birthday Dies. The sentiment is stamped with Cake Day onto a Mini Tag Dies 2. What a wonderful projects!! Your Granddaughter will love it!! Have a great day. Your projects are fantastic! I especially love that 3D cake! The papers you used are totally perfect. Everything is top notch! What a fabulous cake and card Sherrie! Love the papers you chose and the balloons are awesome. 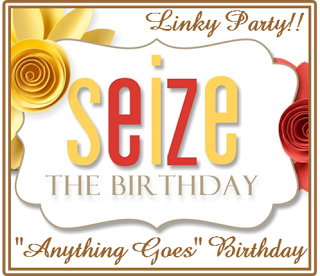 So great to have you with us at Seize the Birthday! Glad to have you here at Seize the Birthday for the next two months. Your first entry is out of this world cute and amazing. A matching cake and card. So creative and festive. My granddaughter was 10 in August, and I used the cameo to make Parisan designs for her birthday party. Love those creative Grandmothers! Very pretty gift set! That layered cake is spectacular! I love the gorgeous colors and papers you used too! I know your granddaughter will love this! Congrats on the guest designer spot! Oh how cute! These are so festive, love the cute papers! Hi Sherrie, welcome to STB as our surprise guest designer. I love your cute card and cake. Very creative. Huge CONGRATS on the GDT!! And your project is AMAZING! I am IN LOVE with that cake!!!!!!! WOWWWWWWWWWWWWW!!!!!!!!!!! WOW!!!! This is so awesome! That cake is fantastic... did you say 5? Unbelievable, I can remember the excitement of her arrival. Awesome job for your guest spot, you did amazing! Omgosh, what a cute birthday set! I LOVE that cake! So fun and such a happy party decor. Love the paper, and love the tower of cake. Adding the tea light on top was just genius. Super fun card, too. Your granddaughter is going to love this! Wonderful projects, that cake is fabulous. What a darling set! Biggest congrats on your guest post! Big congrats to you my friend! !Such a wonderful birthday set!The tower cake is fabulous and the card is super SWEET! !Awesome job! As I said on FB love this set. It too darn cute. Love the papers. Really perfect for a little girl. WOW hard to believe Ayra is turning 5. I remember when she was born. Congrats on your GD spot. We are just as thrilled to have you! Like some of the other teammates have said your first post is fabulous. I bet your granddaughter will love this card and matching cake. A true labor of love! Congratulations on Guest Designing! Your project is wonderful! Such a cute card and awesome cake! Sherrie these are wonderful , ohh soo cute !! Fantastic colors and patterns !! What a great project, very special for your granddaughter. Congrats on your Guest design spot and thanks for visiting me. Wowie!! I want you to be MY Grandma!! : ) These are spectacular what a treasured keepsake! Every time I see your creations I feel like I am going to have to kick it up a notch or three! You really are talented and a delight to have with us as a Surprise guest! We are the lucky ones!